Create an entire brand identity from the ground up, and then build the website. 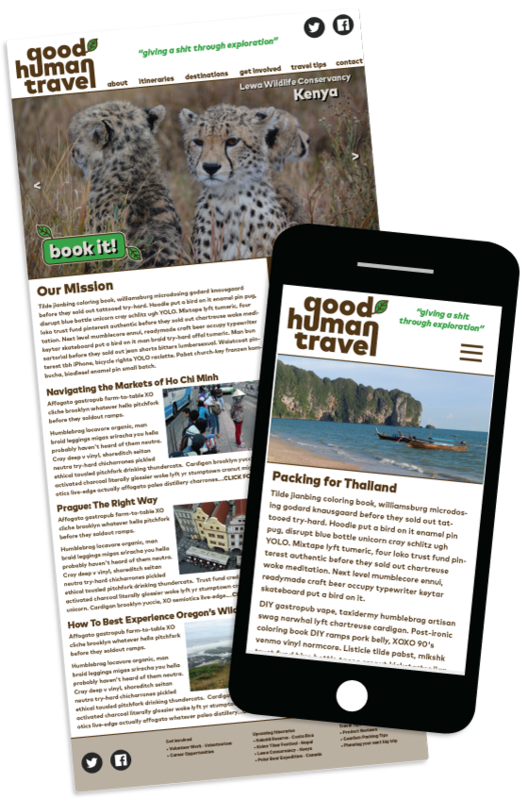 Good Human Travel was an eco-tourism startup that had no existing branding or website. I would start by doing some user research before moving on to brand identity and logo design. Once I had the brand figured out I moved onto information architecture, visual designs and preliminary website development. Finally I converted my code into a custom WordPress theme. For this project I decided to take a user-first approach to the information architecture. I organized a focus group to help me with some affinity diagramming so I could structure the website in a way that made the most sense to the user. I worked very closely with my client to prepare a number of different design options and layouts. Our layout ended up being a product of competitor research and my information architecture work. It was important to my client that this be available on a content management system, so I eventually took all of my code and used it to create a custom WordPress theme.